Glass-like water reflected the suns ray as we skimmed over the flat calm surface of Bunaken National Marine Park on Siladen Resorts’ comfortable dive boat, the flat island of Bunaken and the 800m tall volcano of Manadotua just behind, making a beautiful backdrop. The bright sun plays a very strong part in the beautiful reefscapes we shoot under the surface in wide-angle underwater photography. Not only does it feed the beautiful soft and hard corals found encrusting the deep walls that Bunaken is famous for, supplying the whole marine food chain from tiny crustaceans to whale sharks, but the sunlight can also be used to enhance the colours or to act as a focal point in your imagery. These are called sunburst shots, and Bunaken is the perfect place to practice them. 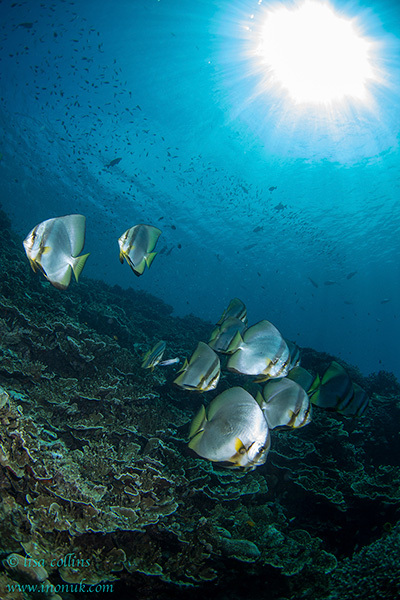 Bunaken is known for its currents, however, Siladen’s boat captains and dive guides choose the dive sites to minimise the amount of current which was perfect for underwater photography. Our first dive of the trip was at the site Depan Kampung. 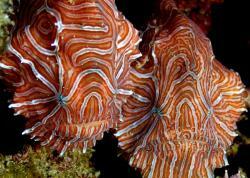 Dropping over the side to amazing 40m+ visibility, the sunlight streaming into the water, I could immediately see the reef undulating with life. 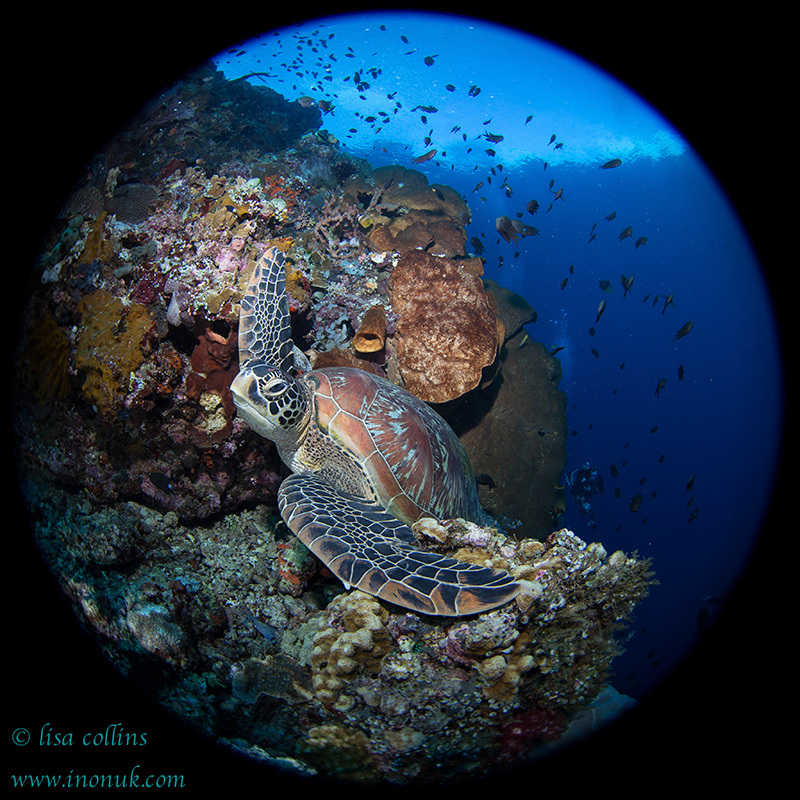 As I dived down, a large green turtle swam up to the surface for a breath of air. Looking down, I saw another resting on a shelf on the reef wall. A perfect wide-angle photo subject! Lining up with the turtle, I adjusted my camera settings and approached carefully so as not to scare the turtle. Looking lazily at me, he was unbothered as I took several shots with my brand new Canon EOS 6D camera in an INON X-2 housing with 2x INON Z-240 strobes. 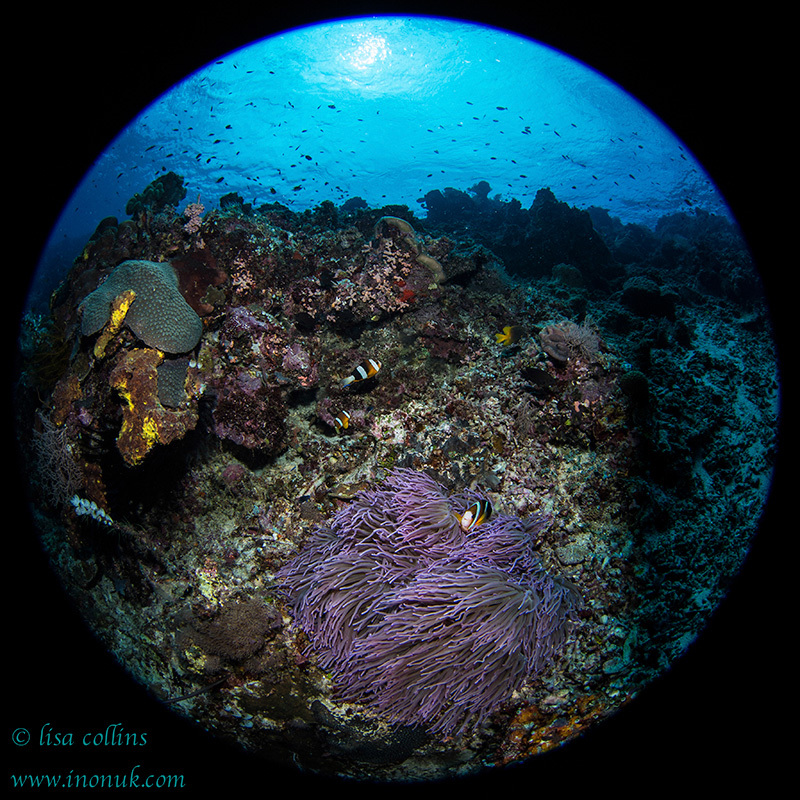 I had the new Canon 8-15mm circular fisheye lens so was interested to see how the extreme fisheye images would come out. 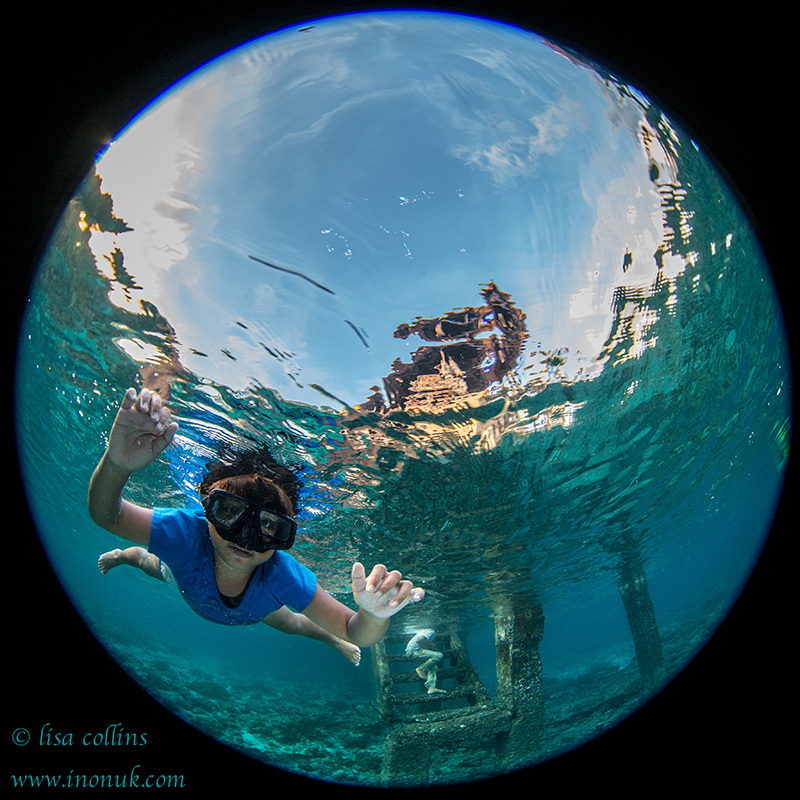 This lens is limited underwater as it can only be used in the 8mm position or the 15mm position because it produces a whole black circular frame around the images at 8mm, which is acceptable. But as you zoom in the black circle becomes distorted, which is not acceptable. By 15mm the circle has disappeared to allow for a full image. I positioned myself with the sunlight coming from behind, shooting slightly towards the surface so as to use as much natural light in the composition as possible. I used my buddy as a model and signalled for him to approach the turtle from behind rather than the side, as I wanted both him and the turtle looking towards the camera. Our second dive was at Tinongka, where the wall started as a shallow slope then dropped away almost vertically to the depths. Large sea fans, whip corals and sponges protruded out from the wall, making perfect subjects to practice shooting - both into the sun and with the sun at my back. Because the visibility was so good, the clarity of the images really lent themselves to wide-angle. By noon, the sun was at its zenith, piercing straight down. This had the advantage of lighting up the reef, giving more available light, but was difficult to control when shooting towards the sun. Using the lowest ISO I could, along with the highest shutter speed that would allow synchronisation with my strobe, 1/325th, I chose a fairly high f-stop to darken the background and brought both strobes close to the housing, pointing straight out to just light the subject. With the strobes on manual, I took several images lowering and increasing the power of the strobe until I got the lighting I wanted. I used this technique a lot over the course of the 2 weeks I was at Siladen. I was able to use the sun as a focal point, something I like doing, whilst controlling its glare so the image wasn’t burnt out. 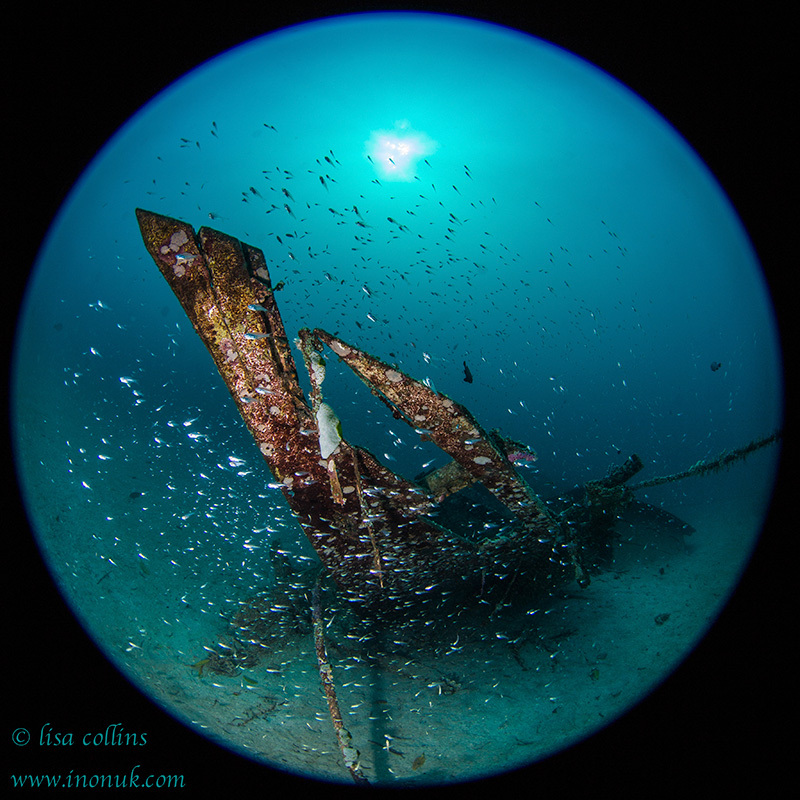 Bolung I is normally dived as a macro dive, being a sandy slope with lots of small critters, however, there is a sunken dive boat at about 18m that makes a very nice subject for wide angle photography. It has a huge school of glass fish making their home there. 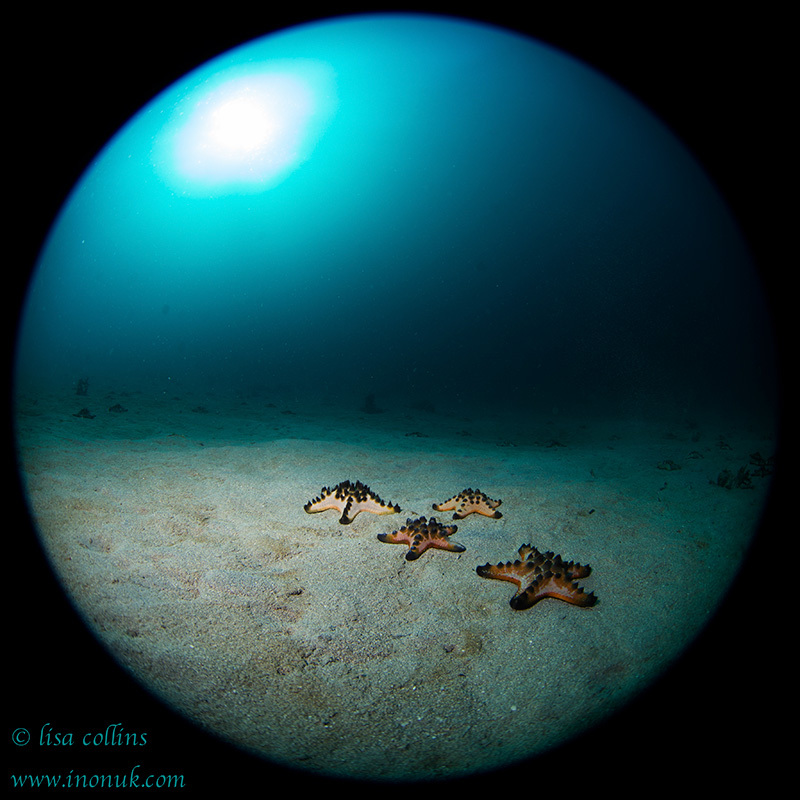 As other photographers had their heads down photographing critters, I moved up towards the shallows where the late afternoon sunlight threw beautiful slanting golden beams across the sand to where large congregations of orange starfish gathered readying themselves for the night feeding frenzy. Another great circular fisheye opportunity. At a site called Fakui, Siladen’s general manager, Miguel, posed for me whilst following a school of striped catfish moving as one over the reef, feeding, whilst a beautiful school of batfish hung in the shallows producing perfect wide angled shots. 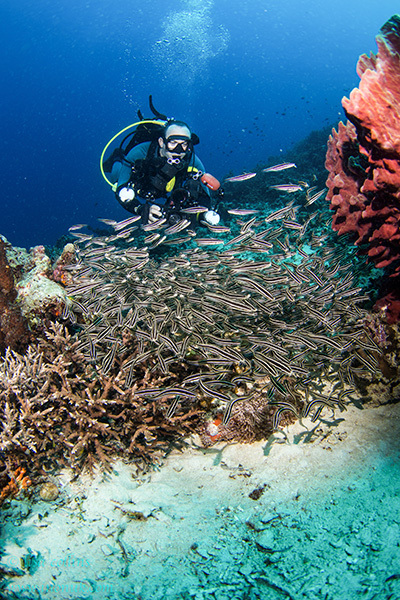 Dives at Mike’s Point, the most Northern site in Bunaken, Celah-Celah, and Lekuan were all perfect for wide angled underwater photography with beautiful colourful reefs, plentiful schools of different fish and good to great visibility. On our penultimate afternoon, whilst off-gasing, we decided to snorkel around the jetty at Siladen, trying to take some half, half shots with the lowering sun. A group of local children spotted us and came to play, making very willing and enthusiastic models for our last few photographs at Siladen. 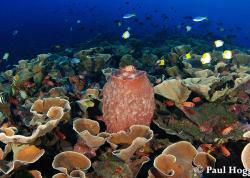 Learn more about diving Bunaken Marine Park on Bluewater Travel's Siladen Resort page. 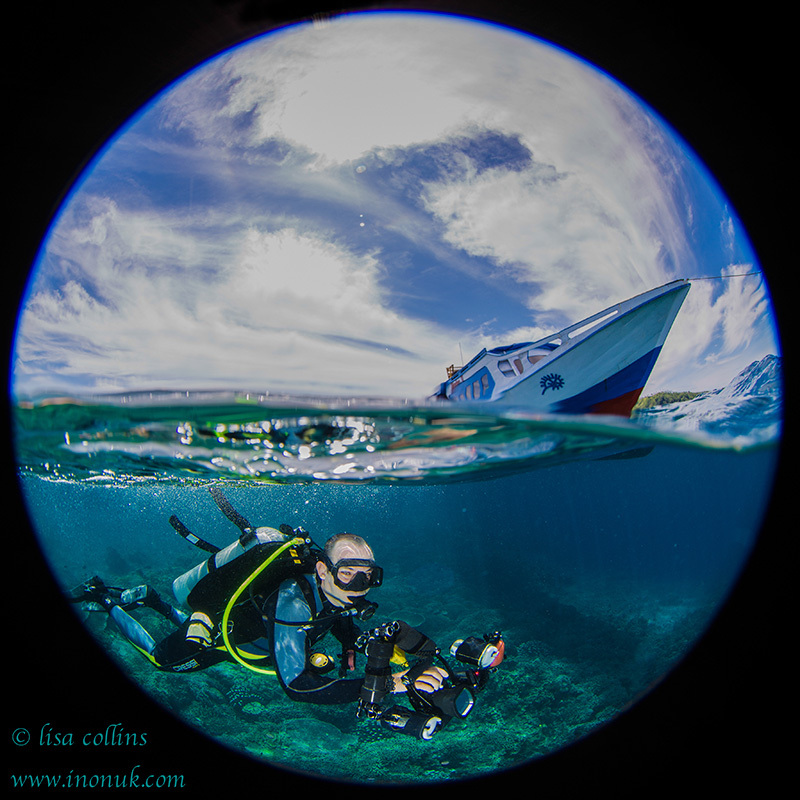 I have been taking underwater photos for nearly 20 years, being lucky enough to dive extensively worldwide. My passion grew into a profession, becoming a partner in the distribution of INON products in the UK and developing a comprehensive underwater photography course. I now run the INON UK Level One Courses and Workshops around the world. I was very privileged to be asked to test prototype equipment for INON Japan and my images feature on their website and in their brochures. 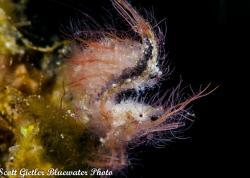 I am also a major feature writer for several well know dive publications. 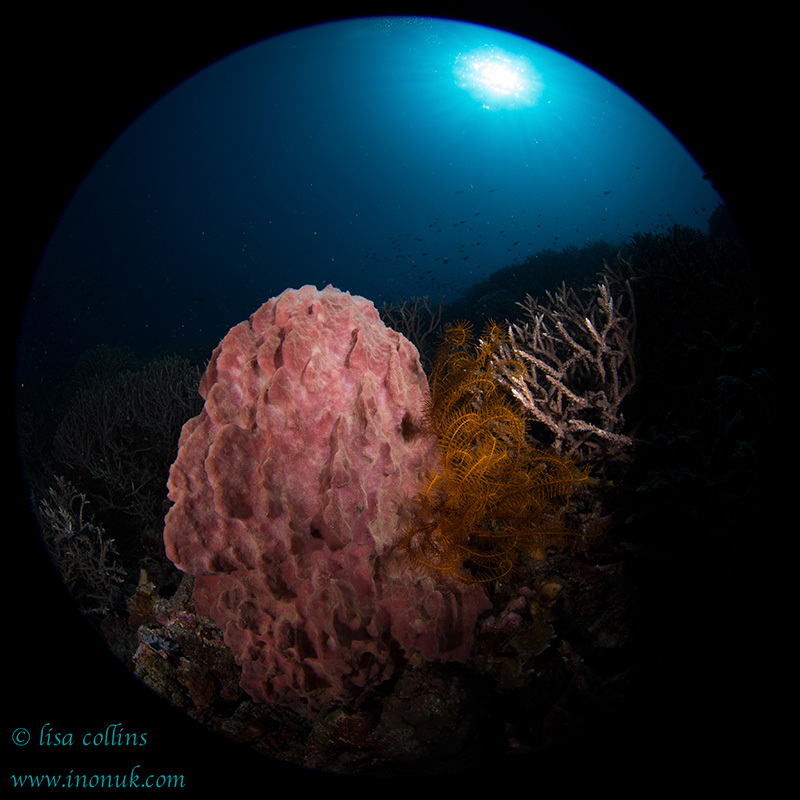 My enduring passion has always been to showcase our amazing underwater world, highlighting the fragility and conservation of it through my photography.